I wait all year for October and so far it has been well worth it. Friday night my neighbor Jimmy came along for some topwater action. We hit a few lake Riva spots with no action as we made our way to the "new house" spot that James and I had slayed them Thurs. 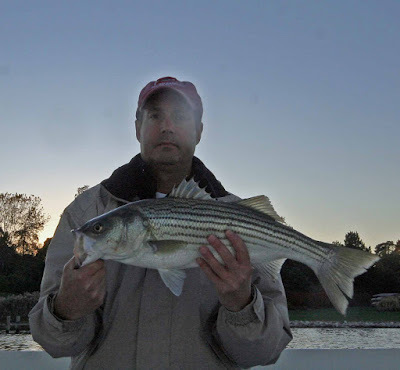 On my 2nd cast I had a nice blow-up and had our first Striper..too close to call. The wind was really blowing, so we made our way over to Aberdeen creek and drifted the point. On our second drift I had a huge blow up that looked like a striper, but the fish was really peeling drag. Then the fish jumped and I saw it was a Blue...a nice fat 4 pounder. Best fight from a blue all year. Hit "6 mph" sign on way in and had several blow ups that missed. Jimmy fished with me again Sat Am, but we got shut out. Sat and Sunday were blowing 20 plus knots so fishing was tough. Did manage to pick up one 18 Sunday night at "6 mph". Tonight I headed out to the "new house" and anchored up near the point at 5.30. Things were slow for the first 15 minutes and then the fish really turned on. At 5.45 I picked up a really nice 28 on my light-med St Croix. Now that was fun. Proceeded to pick up a total of 10 Rock from 18-22. I was chilly but a perfect TW night. Can really feel the fall in the air. Hey Rich, John your neighbor here. Got some news for you. Call me 410/703-6630.